I admit that I’m a restless reader and one who is attracted to the irreal. If a writer doesn’t undermine reality at least a little and doesn’t challenge or startle me at least once within the first few pages of a novel or volume of stories, I usually don’t read on. During my Year of Reading at the Irreal Cafe (see previous post), I decided to start with New York Hotel by Ian Seed and I readily finished this latest collection of Seed’s prose poems. The cover of New York Hotel is nicely designed but features a fairly realistic if slightly off-kilter photo of an old brick hotel. We can see architectural details, such as wrought-iron railings, ornate architraves and a neon sign that reads HOTEL, and according to the acknowledgement on the back cover, the photo does depict an “Old hotel in New York City.” But though I was concerned that the concrete image on the cover meant that Seed was going to present us with a more concrete fictional depiction of reality than he has done previously (Kafka, after all, didn’t want an insect to be portrayed, even from a distance, on the cover of Metamorphosis), this did not turn out to be the case. In this slim volume I found Seed’s usual rich mixture of the real and the irreal, which makes reading it a compelling yet unsettling experience. Or maybe I should say that reading these short pieces one after another is rather like having a series of small, restless dreams while napping on a train. In these dreams we might encounter people from the past, have anxiety-producing experiences, find ourselves in unusual places, or encounter the fantastic. And when we awake, we are discomfited by the intensity of the remembered dream and also by the disorienting effect of not being in our own beds and possibly not even in our home city or country. The unfamiliar permeates our most ordinary experiences, as is the case in New York Hotel (and other collections of Seed’s work) when believably realistic descriptions are enriched by the presence of the irreal. As I noted in an earlier essay, I believe writers have personal symbols that they use over and over again — Leonora Carrington’s horses and Borges’ labyrinths come to mind. From among Seed’s apparent personal symbols, I am especially intrigued by how often he has made reference to male American singers who were popular during the mid-twentieth century. Mind you, this is not his most frequently used symbolic reference, but it’s one I have especially enjoyed and which has been used in a surprisingly irreal way. In an earlier collection, Makers of Empty Dreams, Elvis and Elvis impersonators appeared in “In the Anniversary TV Special, the Real” and “In the Empty Church.” Both prose pieces touched on the wishful thinking of ardent fans who believe that Elvis is still alive. But in the former this possibility is considered against the background of an Elvis impersonator contest, while in the latter Elvis makes an appearance after his death, singing in a voice that is “more powerful than it had ever been.” These very short pieces portray Elvis fans, impersonators, and the singer himself in a way that succeeds in undermining all our expectations. Elvis makes an appearance in New York Hotel as well, though he is implied and not named in “Loved” in which a woman named Priscilla weeps over the fact that “our adoration had killed her loved one.” In two other pieces, “Festival” and “American in Rome,” the narrator sings Elvis songs in situations that undermine reality as we know it. In the former prose piece, the venue is a park that “stretched away as far as the eye can see”; in the latter, the narrator sings “All Shook Up” to an enthusiastic Pope, who claps and sways to the music. An attentive crowd, and finally the narrator’s ex-wife, are equally moved by his performance. In this volume an aging Jerry Lee Lewis also makes an appearance in “The Killer,” playing his boogie-woogie from a wheelchair, “the music as beautiful as ever.” This piece doesn’t strike me as irreal (Lewis was known as The Killer and is still alive and performing), but my reading of the story is enriched by the Elvis references in the above-mentioned prose pieces. And in “New York Hotel,” a Gene Kelly impersonator, who has crooned “Singing in the Rain” through an underpaid lifetime, is given a chance to tell his story and is portrayed in a sympathetic and offbeat way that is also gently irreal. Seed inserts these formerly popular American singers into places and situations that undermine our expectations, leading to effects that are sometimes comic, sometimes poignant, and often irreal. If you read our guidelines, you will see that The Cafe Irreal is entirely devoted to irreal short fiction under 2,000 words. We don’t publish poetry at all. Having said that, I acknowledge that we do sometimes publish prose poems that display elements of a story — character, plot, setting – and which also show reality being undermined as an irreal story does. This quality is notable in Seed’s work, and his prose pieces (often called prose poems) have appeared in Issues 23, 42, 47, 55, 59, and 63 of our web publication. In fact, “Generation Gap,” “Free Will” and “Loved,” which you will find in Issue #63, also appear in New York Hotel. You can buy New York Hotel by Ian Seed at Shearsman Books. Yes, I know, The Cafe Irreal Coeditors have been ignoring this blog shamefully of late, but that’s about to change. First off, a little history: In June of 1998, G.S. 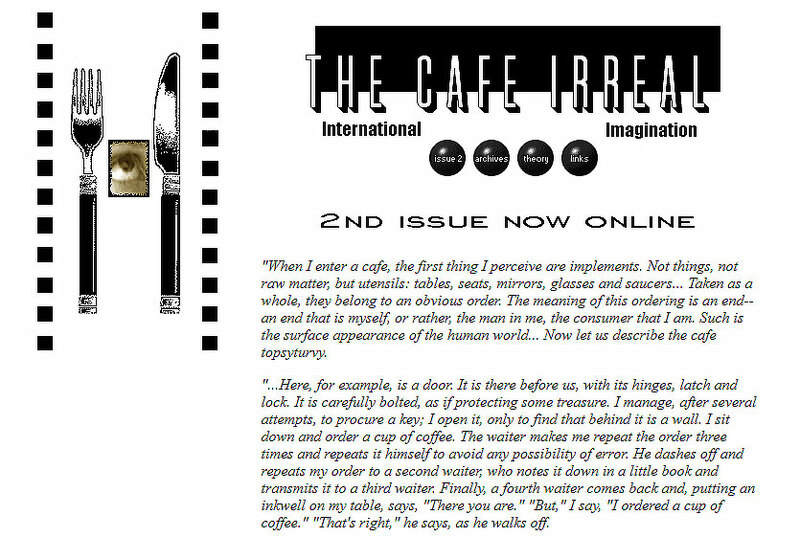 Evans and I uploaded what we called Issue 0 of The Cafe Irreal to the internet. That was a long time ago in internet years, and it’s worth noting that next year we will celebrate our twentieth anniversary of tending this small but influential webzine. Though Issue 0 itself no longer exists (it was basically a call for submissions), you can get a very good idea of what The Cafe Irreal looked like back then — built with all those awkward old HTML 4 tags, some animated gifs, and a boundless enthusiasm for the irreal — by going to this Second Issue page. Now flash forward almost twenty years: We have a responsive HTML 5 site that uses more static graphics, but we still have boundless enthusiasm for the irreal. And that’s why, to celebrate our upcoming twentieth anniversary, we are launching our Year of Reading at the Irreal Cafe. It actually began on February 1 of this year (hey, I had to read something to comment on before I could make this announcement), and it will conclude on February 1 of next year when we present our twentieth anniversary issue. Look for commentary on collections of short fiction — and maybe some plays — by contributors to The Cafe Irreal, beginning on February 9 February 10, 2018.